In this story of Coyote, we discover that he does not understand the cultural rules about gift giving. When he returns and demands the Rock, Iya, give his blanket back Coyote has disregarded the cultural belief that what is given is given forever. He is reminded that the blanket is no longer his by Iktome who says, “It is Iya’s blanket now!” Coyote still thinks of the blanket as being his. When Iya tells Coyote “NO” because he likes having the blanket.” Coyote explains that it is cold out and he needs HIS blanket back. He tells Iya he doesn’t want to catch a cold. Yet, Iya still says “NO!” This makes Coyote angry. Coyote just takes the blanket and leaves. Iya warns him that it is not over. There have been times in my life when I have not understood the rules or the person I’m dealing with seems to have a different set of rules that I don’t understand. The whole idea of etiquette or manners is to make social interchanges comfortable and pleasant. The newspaper columnist Dear Abby or the writer Emily Post are often asked about what manners and/or etiquette rules apply in very specific social situations. Not all rules are written down. In addition, as our society becomes more and more complex new rules have to be established. 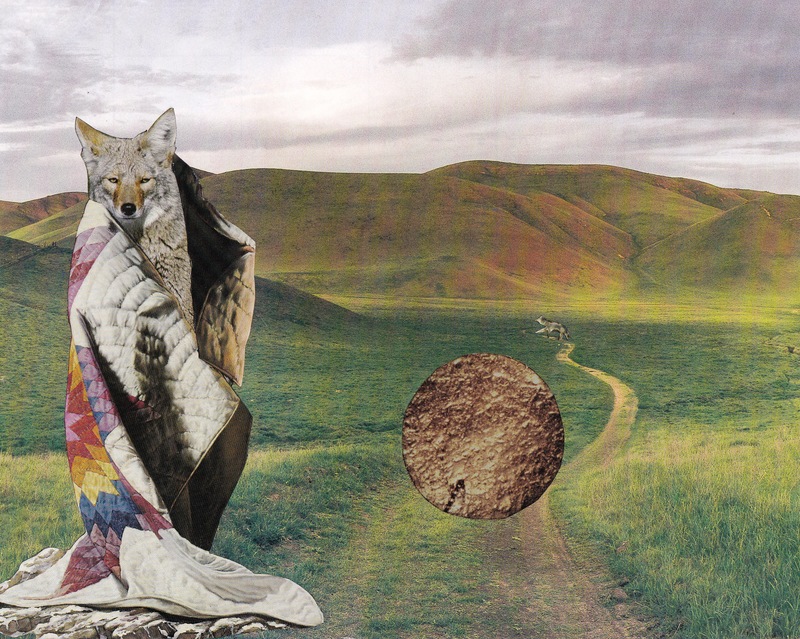 My collage this week shows the Rock chasing Iktome and Coyote through the river. Coyote has his blanket flapping behind him. The over all collage depicts a patchwork broader suggesting that the entire piece is a blanket. The reason for the dispute.